In 1974 the U.S. Congress passed Public Law 93-531 allegedly to settle a so-called land dispute between the Dineh and their Hopi neighbors. This law required the forced relocation of well over 14,000 Dineh and a hundred plus Hopi from their ancestral homelands. The “dispute” being settled by PL 93-531 was, in reality, fabricated by the US government as a way to obtain easier access to strip-mine one of the largest coal reserves in North America. The land known as Black Mesa is home to thousands of traditional sheepherders, weavers, silversmiths and farmers. For hundreds of years before Europeans came to the Americas the Dineh and Hopi existed in balance with each other and with Mother Earth. The genocide on Black Mesa has been recognized internationally. In the late 1980’s the United Nations described the case of the forced relocation as one of the most flagrant violations of indigenous peoples’ human rights in this hemisphere. More recently, this is the first time the United Nations ever formally investigated the United States for the violation of religious freedom. On Black Mesa Peabody Coal Company mines over three million gallons a day, and 1.4 billion gallons a year of pristine, potable groundwater used to slurry coal. It’s the only source of drinking water for the Hopi and the western Navajo people. According to data compiled by the Department of Interior, Peabody’s operations appear to be causing or contributing significantly to a range of groundwater-related problems, with profound environmental, cultural, and religious implications for the region’s tribal communities. (source Natural Resources Defense Council) Peabody Coal Company in the Black Mesa region operates a 103-square mile mine, the largest privately-owned coal mine in the world. These native peoples, their cemeteries, their burial & sacred sites, religious structures and Anasazi ruins have been destroyed at Black Mesa to make way for coal mining. People are not only restricted from access to sacred sites, but many religious sites, burial grounds and homes stand threatened with destruction. Many families on Black Mesa are now in their third decade of resisting relocation, attempting to continue their traditional lifestyles. As a result of their resistance the U.S. government is waging a covert war against the people and the land. This includes bulldozing homes and ceremonial structures, impounding sheep, horses, and cattle, destroying water wells, restricting wood gathering, disallowing the construction or renovation of homesites, restricting ceremonies, restricting medicinal herb gathering, ongoing surveillance and intimidation by police and federal agents, and harassment by low flying military aircraft. The Dineh believe that the rich coal reserves underneath this sacred land is Mother Earth’s liver and must not be destroyed. However, these beliefs fall on deaf ears to Peabody Coal Company, which sees the coal as simply a way in which to produce large amounts of capital. For over a quarter of a century this extremely powerful corporation has mined the 103 square miles around the mesa area leaving behind a wake of devastation. A land that was once so rich in natural beauty is now left barren and dead. The mine has displaced thousands of traditional families and their homes, destroyed an estimated 4,000 ancient ruins, burial sites, sacred land formations, and prayer sites. In order to further the development of the mine, Peabody bulldozes important plants and trees used by the Native peoples for food and medicine. Many people believe that today much of the mine operates illegally and without regulation. This mine uses a coal slurry pipeline to transport its coal over 200 miles to the Mojave Generating Station in Laughlin, Nevada. There, it is converted into electricity for the use of Nevada, California, and central Arizona, while many of the Dineh who live at Black Mesa and in most areas of the reservation have no electricity. The coal slurry pipeline uses billions of gallons of water to move the coal. Water is pumped from the precious desert aquifer under Black Mesa, used solely for mining purposes, while only a few miles from the mine families have to haul water for themselves and their livestock, from up to 20 miles away to survive. Countless springs and wells have gone dry, grazing land has been dried up and depleted, and crops have begun to fail. 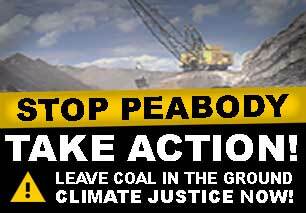 Peabody makes billions of dollars annually from the mine, while the traditional peoples living on the land being mined, or who have been relocated because of it never see a cent of the profits made from the land. What happens to the people when they relocate? The federal government has relocated many of the Dineh to the “New Lands” at Sanders, AZ. This land is contaminated by the worst radioactive waste spill in North America. (It is downstream from the disaster at Church Rock, New Mexico, 1979) Some people living there have died from cancer or are dying from it now. The birth defect rate is outstanding. And many of the traditional ways are gone. People live in tiny trailers side by side, hundreds of miles away from their families, with no sheep, no sacred sites, no cornfields, no ceremonies. Many people who relocate find themselves with nothing to live for, their sacred way stolen from them. The suicide rate is outstanding as well. A special report concerning Navajo relocation issued from the Navajo-Hopi Land Commission Office over ten years ago testifies that they’ve “seen hundreds of Navajo families become practically homeless. They left their ancestral homes on the Hopi-Partitioned Land in order to comply with the federal governments’ directive. These families, the so-called Navajo ‘refugees,’ have drifted from place to place for many years. Some live in shacks, some live in vehicles, while the lucky ones squeeze in with other family members.” Others have found themselves having to pay for water, heat, food, electricity, taxes, things they never have had to deal with before. Many of the elders speak little or no English – people who have had no experience with a cash economy have been moved to border towns. These Navajos have been warehoused in substandard housing. They have received little or no counseling to help them make the radical changes that federal law has required. And while the relocation law has required the federal government to provide community facilities and services and to minimize the adverse social, cultural, and economic effects of relocation, that promise remains unfulfilled almost two decades later. Many find it impossible to get jobs, and they are forced into homelessness. The genocide is complete. There are still Dineh families on Black Mesa who are resisting relocation and do not wish to sign an Accommodation Agreement. 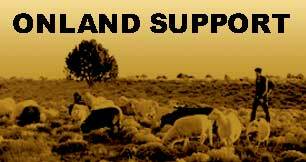 There are many families struggling to keep their livestock. Despite years of lawsuits against the federal government to repeal the relocation law, the United States continues to deny the Dineh the right to live on their homeland and preserve their traditional way of life. The resisters of Black Mesa have requested outside support in their struggle. Most of the relocation resisters are elders, many of whose children have been relocated or otherwise forced to leave their homeland. As a result many elders live alone and it is difficult for them to continue their daily lifestyles while also going to court and dealing with the everyday harassment from U.S. and tribal governments.